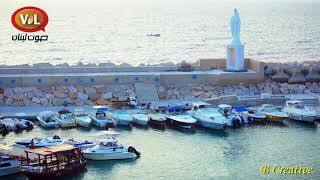 Given its cultural and religious significance, the Statue Of Our Lady of the Seas in Amchit captured the attention of the media. 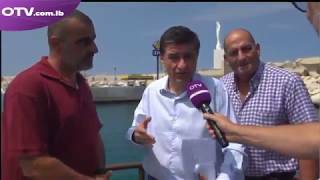 The team of "Sellom 3a Sama" show on OTV came to Amchit seaport to interview Dr. Toni Issa, the President of Michel Issa Foundation for Local Development (MIF), and to take live shots and footage to prepare a full report about the statue. The report will be aired soon on OTV. In parallel, Mr. Hassan Rizk, General Secretary of the Fishermen Cooperation in Amchit, was interviewed by "Al Nour Ma3ana" program on Tele Lumiere presented by Cynthia Makhlouf. In his interview, Dr. Issa explained that this initiative came as a result of a collaboration between Michel Issa Foundation for Local Development (MIF) and the Fishermen Cooperation. It aims at fostering social, economical, and cultural aspects not only of Amchit but also the whole region of Jbeil. He explained that this initiative comes in line with the mission and objectives of MIF in enhancing the capacity of the local community through the planning and implementation of local development projects in coordination with local authorities, municipalities and the civil society. At last, Dr. Issa stated that this initiative will be celebrated by a mass organized to inaugurate the statue under the patronage and in the presence of Maronite Patriarch Cardinal Mar Bechara Boutros Rahi, and in the presence of Maronite Bishop of Jbeil Michel Aoun. He announced that the mass will take place on Friday the 17th of August 2018 at 7:00 p.m. at Amchit seaport and the invitation is open to the public. In his turn, Mr. Hassan Rizk explained in details to Tele Lumiere team about the the achievements of the Fishermen Cooperation in Amchit, the history of Amchit seaport, and the positive influence of Our Lady Of the Seas on the people of Amchit, especially the sailors, for whom fishing profession is considered to be the main source of income. He thanked MIF for turning this project into a reality. Click here to watch interview. On Thursday August 9, Dr. Issa and Mr. Rizk will also be hosted Live on "Men Kell Chi" radio show on VDL (93.3 MHz), presented by Mariam El Ellyeh. Stay tuned to Michel Issa Foundation Facebook page to check the report and interviews. 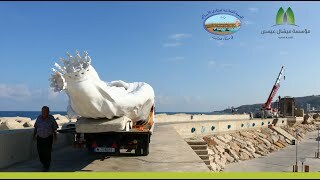 Check video and album of pics showing the transportation and installation process of the statue, in an atmosphere of joy and enthusiasm. More "Related News & Media" are available below.